The Plagues and Passover (Ex. 7-14) – anything representing one of the plagues, like a cup of “red water,” toy flies, a paintbrush with red “blood” dried on it, etc. 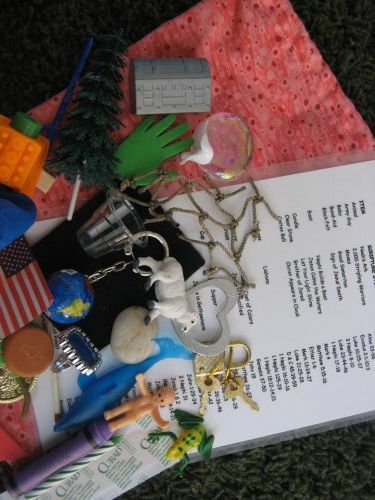 Here are several other suggestions for storage for your storytelling “grab bag” (box? tube? ): Decorate an empty wet-wipes container (see http://momstown.ca/2013/10/23/how-make-treasure-box-diaper-wipe-container/); a covered oatmeal tube or coffee can (see http://modpodgerocksblog.com/2009/09/delightful-toy-containers-made-from.html); or a paper-covered shoebox (this one suggests using maps, but any pretty paper would work: http://inmyownstyle.com/2013/09/map-covered-shelf-organizing-boxes.html) and store your story-starters in there instead of in a bag! This entry was posted in Ideas, Scripture, Sunday Church School Teachers and tagged Activity, Christian Education, Ideas on July 1, 2016 by orthodoxchristianparenting.